Earlier this year, a little-known Chinese company emerged as a potential suitor for AMD, the US-based archrival to Intel. That company, Loongson, shares common roots with Lenovo, the world's biggest PC manufacturer and has quietly amassed a rumoured war chest of 120 billion yuan (about $18.8bn, £12.1bn, AU$26.3bn). A massive bounty that it may want to use to take on the global microprocessor market (CPU or processors for the rest of us) which is currently dominated by Intel and ARM. We caught up with the president of Loongson, Weiwu Hu, to discuss about the company's plans. Techradar Pro: What computer do you use every day? Weiwu Hu: [I use] is a laptop that uses our Loongson CPU. I have been using PCs and laptops with Loongson CPUs for my daily work for more than 5 years. In fact, the answers for this Q&A have been written on that same Loongson platform, the one you see in the picture. TRP: Can you tell us more about Loongson, where it comes from, why it was launched and how big the company is? WH: We originally started in 2001 as a CPU research center that was part of the Institute of Computing Technology (ICT) inside the Chinese Academy of Sciences (CAS). In 2010, according to the requirements of ICT-CAS, we decided to set up Loongson Technology Corporation Ltd. with a clear mission to bring the fruits of our research work to the market. We soon found that we needed to refocus our research to fully meet the requirements of the computing market. For example, academic research in ICT promoted the use of many-core architectures for chip design, but the consumer market required dual-core or quad-core products that were missing from our roadmap. Furthermore, we discovered there was more work to be done to improve the performance of our Loongson CPU. We thus worked hard to improve the micro-architecture dramatically. Today, we are very excited to announce that the sophistication of the Loongson GS464E micro-architecture is on par with Intel's Ivy Bridge, which enables us to address many market requirements. We have around 300-400 hardware and software engineers developing our core CPU technologies but also software and toolchains, rivalling the size and scope of many processor companies. Additionally, our ecosystem of our customers and partners has rapidly grown to include over 10,000 software and hardware engineers developing products based on our CPU technology. TRP: Why did you choose MIPS and not ARM as most other vendors? WH: Our goal is to build a new ecosystem that will challenge the existing CPU providers. The MIPS architecture provides a way for us to differentiate and quickly achieve our goal. MIPS provides very high performance at lower power and reduced area in comparison with their direct competitors. By choosing MIPS64, we also have access to the one of the most mature 64-bit software ecosystems in the industry. In addition, the MIPS architecture license is more flexible than ARM. For example, MIPS customers can add new instructions through UDI (User-defined interface). TRP: You also developed your own Linux distribution. Why was that the case? WH: Firstly, we try to contribute as much as possible to the open source community. For example, Loongson Technology is one of the 14 companies working on (Google's) Chromium, and contributed almost 100,000 lines code to this project. Secondly, we have several operating system partners and many PC and server customers in China that prefer to use LOONGNIX, our in-house Linux distribution. Servicing all these partners one by one would have been an inefficient approach, so we decided to create and maintain LOONGNIX to service them in parallel. This also enables us to collaborate with our partners and continuously improve the ecosystem of Loongson CPU together. TRP: Your focus seems to be on desktop, servers and embedded. What about mobile? WH: The most important factor for us is to focus on certain industries where we believe we can make a difference, rather than trying to hit all possible markets. We currently have a development plan that stretches to 2020. We plan to support customers in desktop, servers and embedded markets. We also have CPUs used in mobile devices running Android and Linux OS, but only for certain very well-defined applications. Our goal is to start with the markets mentioned that require good embedded performance, then evolve to markets with more high-performance applications running on general purpose operating systems. We plan to expand into the open computing market after 2020. TRP: Could you tell us more about LoongBT and how it could help developers? WH: LoongBT is a set of instructions added to MIPS to speed up binary translation of x86 and ARM applications running on a Loongson CPU. 90% of the instructions of x86, ARM and MIPS ISAs have the same core functionality. Therefore implementing a binary translation mechanism for these instructions from x86 and ARM to MIPS was a smooth process that resulted in high efficiency. But we found that the other 10% may greatly reduce binary translation efficiency – code would run up to 10 times slower without hardware acceleration. LoongBT implements acceleration for these 10% x86 and ARM instructions using the MIPS instruction format to make the translation of all instructions from x86 and ARM to MIPS very efficient, and more than 10 times faster. Of course, the run time structure such as registers and TLB should also be improved and that improvement is part of LoongBT. TRP: How do you see the global market for processors evolving over the next 12 months. Any trends (HSA, lower power consumption, greater role of GPU etc)? WH: As I said, now we are mainly focusing on applications and use cases for certain industries. 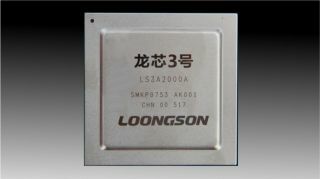 Loongson is still a small CPU company and it is more important for us to work closely with our customers to understand their requirements, rather than simply pursue international trends. We've found that if we work hard with partners and customers to build this new ecosystem, we can create highly optimized solutions that are much better than repurposed generic systems from mainstream providers - even though each part of the system might not be as good as its mainstream counterpart. TRP: What is your relationship with AMD? WH: Loongson CPUs use the HyperTransport system bus [from AMD], and some Loongson motherboards use AMD's chipsets. Can MIPS and ARM actually compete in the server market?